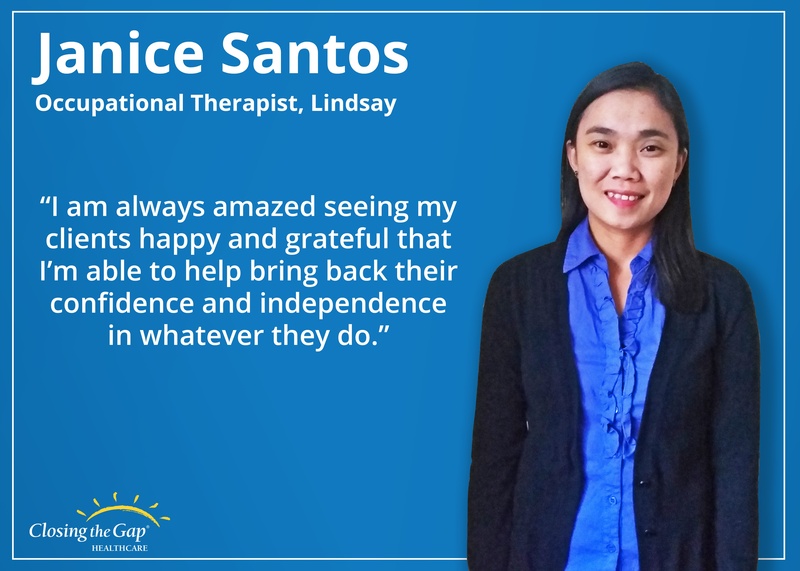 The Occupational Therapists (OT) at Closing the Gap Healthcare help people live their lives to the fullest by removing barriers from everyday living. Whether they are helping clients with equipment training and education, linking to community resources, or performing home assessments and modification recommendations, their passion for caring and unique skillset is truly admirable. 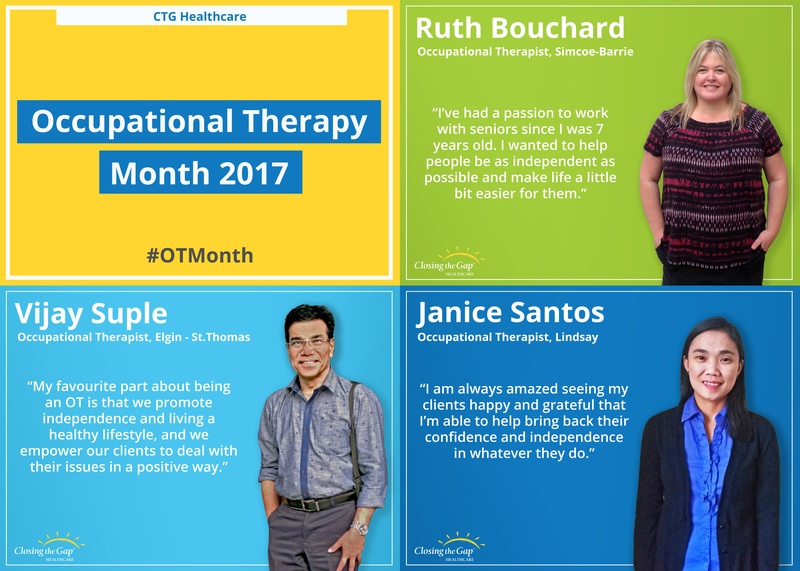 October was Occupational Therapy Month, and to celebrate, we featured three different Occupational Therapists from CTG and spoke with them about what it means to be an OT. 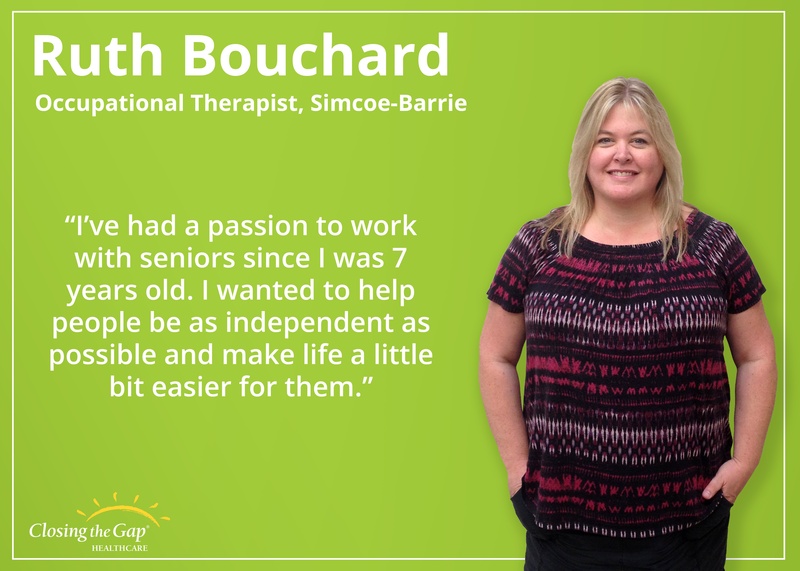 Meet Ruth Bouchard, a passionate Occupational Therapist and employee at Closing the Gap since 2007. “I've had a passion to work with seniors since I was 7 years old as an "Honourary Kinette". I wanted to help people be as independent as possible and make life a little bit easier for them, especially for seniors. I love the interaction and making a potential difference in their lives each and every visit. The amount of ways to help others in OT is amazing, from teaching energy conservation, to using assistive devices, to making homes accessible and to teaching adaptive strategies, just to name a few. Most people don't know this but Occupational Therapists aren't actually Physiotherapists or people that help you get a "job or occupation". OT's address "daily function" in all aspects of a client's life, and they have a lot of strategies and options available to help clients function better if able. A challenging aspect about being an OT is that we are limited to only 4 visits per client when funded by the LHIN/CCAC. Unfortunately, we cannot address everything clients or families have identified as a concern. With more visits, we would be able to help clients address more of their occupational performance concerns and goals to improve their function and make things safer for them. Clients do have the option to pay privately for additional visits if needed. Vijay Suple is an Occupational Therapist working with CTG for the past 5 years. “My interest in being a health care professional was strong ever since my high school years. However, I was looking for a new and untraditional field, and Occupational Therapy fit in that slot well. My favourite part about being an OT is that we promote independence and living a healthy lifestyle, and we empower our clients to deal with their issues in a positive way. But being an OT can also be challenging at times, especially in community rehabilitation. We sometimes face situations where clients have no financial resources to purchase equipment/aids. Generally we manage to find funding, but it can take a lot of patience. An interesting aspect of the occupational therapy profession is that an OT’s role is always so diverse and dynamic, so there is no “stereotype” image of an OT in people’s mind. Janice is an OT in Lindsay, Ontario, and has been working with CTG for the past 9 years. “I think it runs in our family, caring for others. My mother was a nurse, and my sister is a physiotherapist. As an Occupational Therapist, I am always amazed seeing my clients happy and grateful that I’m able to help bring back their confidence and independence in whatever they do, especially for clients who are living alone. Since publicly funded visits are limited, I sometimes find it challenging when I run out of visits while some of my treatment goals were not achieved yet. I always try to maximize every visit, make follow-up phone calls, and try to bring all my clients as many resources as possible. An interesting part about being an OT is that we can work with various age groups, from newborns to seniors, and in a variety of settings. OTs are also so creative that they can make something useful and meaningful for their clients from the simplest things. All Rights Reserved 2016 | © Closing the Gap Healthcare Group Inc.